Mouse anti Human CD82 antibody, clone B-L2 (MCA1311) used for the identification of CD clusters in cell membrane sheets by immunofluorescence. Physical characteristics of tetraspanin clusters. A: JY B cell membrane sheets were stained for CD37, CD81 or CD82 and imaged by STED microscopy. Right images: magnification of the area indicated in left images. Scale bars represent 5 μm in whole sheet images and 0.5 μm in zoomed images. B: The diameter of tetraspanin clusters measured from intensity profiles by the full-width at half-maximal intensity (FWHM). At least 120 random clusters were measured derived from at least 3 sheets per condition. Kruskal-Wallis ***. Significance by post hoc analysis is shown (Dunn’s multiple comparison tests between CD53 and other tetraspanins). C: Masks were made for individual CD37 clusters by applying a local threshold on STED images, and of each cluster the circularity was plotted against the area. 405 clusters were analyzed from 3 sheets. Left: dot plot of individual clusters, right: boxplot, Kruskal-Wallis ***, significance by post hoc analysis (Dunn) is shown. D: Density of tetraspanin clusters. For every sheet the analyzed surface area and the number of annotated clusters were determined and the number of clusters per μm2 calculated. At least 7 sheets were analyzed per condition. Kruskal-Wallis ***, significance by post hoc analysis (Dunn) is shown. E: Distances from the center of annotated clusters to the center of their nearest neighbor were determined. The red dashed curves show fits of the nearest neighbor curves with random cluster distributions and the average densities from panel D. Clusters of at least 7 sheets were analyzed per condition. From: Zuidscherwoude M, Göttfert F, Dunlock VM, Figdor CG, van den Bogaart G, van Spriel AB. The tetraspanin web revisited by super-resolution microscopy. Sci Rep. 2015 Jul 17;5:12201. Mouse anti Human CD82 antibody, clone B-L2 used for the identification of CDclusters in cell membrane sheets by immunofluorescence. The tetraspanin web revealed by dual color STED microscopy. A and B: JY B cell membrane sheets double stained for CD53 (red) and CD37, CD81 or CD82 (green) (A), or double stained for CD37 (red) and CD53, CD81 or CD82 (green) (B) were imaged by STED microscopy. Middle images: magnification of the area indicated in whole sheets images (most left). Blob detection images (most right) show annotated clusters used for further analysis. Scale bars represent 5 μm in whole sheet images and 0.5 μm in zoomed and blob detection images. C and D: Percentage of clusters of which the distance from their center to the center of the nearest CD53 (C) or CD37 (D) cluster was within 100 nm. Clusters of at least 7 sheets were analyzed per condition. ANOVA ***, significance by post hoc analysis (Bonferroni) is shown. From: Zuidscherwoude M, Göttfert F, Dunlock VM, Figdor CG, van den Bogaart G, van Spriel AB. The tetraspanin web revisited by super-resolution microscopy. Mouse anti Human CD82 antibody, clone B-L2 used for the identification of CD clusters in cell membrane sheets by immunofluorescence. Tetraspanin clusters are organized at a higher spatial scale. A and B: Images: zoom of JY B cell membrane sheets double stained for CD53(Rab) (red) and CD53(Mo), CD37, CD81 or CD82 (green) (A) or CD37 (red) and CD53, CD81 or CD82 (green) (B) imaged by STED microscopy. Scale bars represent 0.5 μm. Graphs: intensity profiles of CD53(Rab) or CD37 (red curves) and CD53(Mo), CD37, CD81 or CD82 (filled green) as depicted in the corresponding images. C: Distances from the center of annotated clusters to the center of their nearest CD37 clusters were determined. The nearest neighbor curves were compared to distance curves (red dashed curves) determined from mock images generated with the corresponding cluster densities and sizes, but with completely random and uncorrelated cluster distributions. Clusters of at least 10 sheets were analyzed per condition. D: Zoom of a B cell membrane sheet double stained for CD53 and CD37. Yellow ellipses indicate CD53 and CD37 clusters that are in close proximity to each other. Scale bar represents 1 μm. Mouse anti Human CD82 antibody, clone B-L2 recognizes human CD82, also known as C33 antigen, Metastasis suppressor Kangai-1, Suppressor of tumorigenicity 6 protein or Tetraspanin-27. CD82 is a 267 amino acid ~50-53 kDa multiple pass transmembrane glycoprotein and member of the tetraspanin family expressed by T cells, NK cells, monocytes, granulocytes and platelets. CD82 transfected murine mastocytoma cell line P815. Ono, M. et al. (1999) Motility inhibition and apoptosis are induced by metastasis-suppressing gene product CD82 and its analogue CD9, with concurrent glycosylation. Cancer Res. 59 (10): 2335-9. Mazurov, D. et al. (2006) HTLV-1 Gag protein associates with CD82 tetraspanin microdomains at the plasma membrane. Todeschini AR et al. 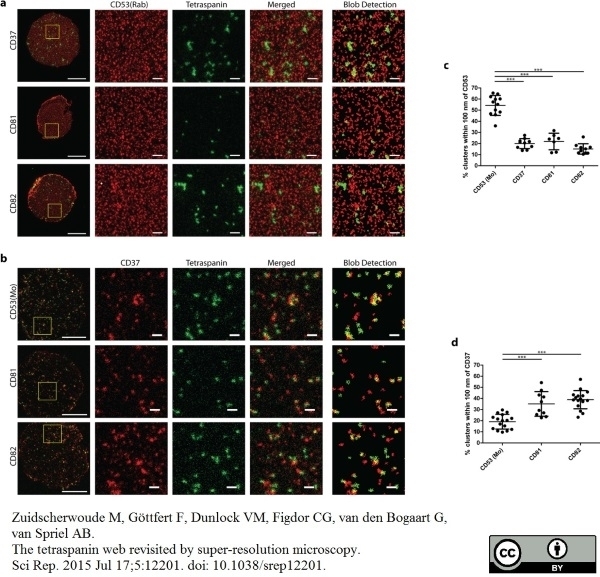 (2007) Ganglioside GM2-tetraspanin CD82 complex inhibits met and its cross-talk with integrins, providing a basis for control of cell motility through glycosynapse. J Biol Chem. 282 (11): 8123-33. Mazurov, D. et al. 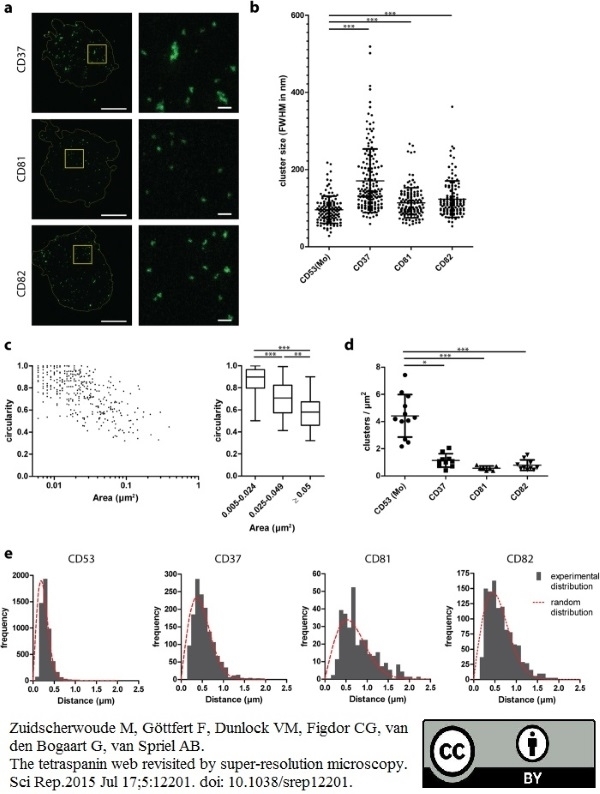 (2007) The inner loop of tetraspanins CD82 and CD81 mediates interactions with human T cell lymphotrophic virus type 1 Gag protein. J Biol Chem. 282 (6): 3896-903. Wang, H. et al. (2012) N-Glycosylation pattern of recombinant human CD82 (KAI1), a tumor-associated membrane protein. J Proteomics. 75 (4): 1375-85. Zuidscherwoude M et al. (2015) The tetraspanin web revisited by super-resolution microscopy. Jones, E.L. et al. 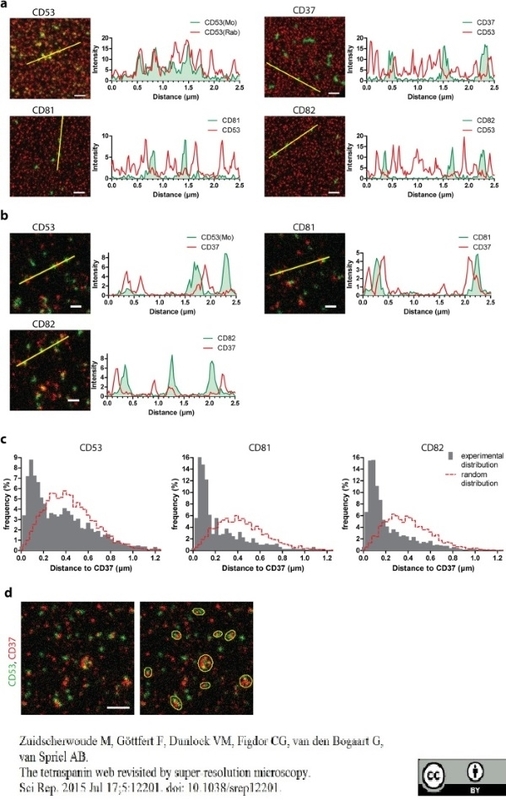 (2016) Dendritic Cell Migration and Antigen Presentation Are Coordinated by the Opposing Functions of the Tetraspanins CD82 and CD37. J Immunol. 196 (3): 978-87.